Gnocchi is a classic Italian dish. In Northern Italy these small dumplings are made from the combination of potato, flour and egg. However other areas use polenta or ricotta to form the base of gnocchi. 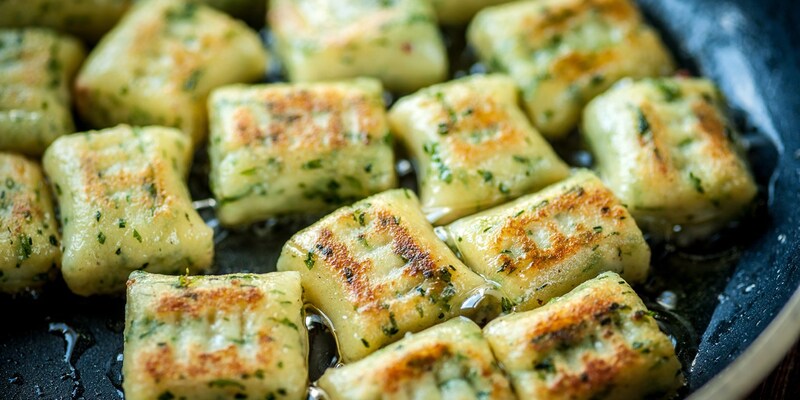 The secret of great gnocchi lies in the variety of potato used and the way it is cooked. Once made, gnocchi makes for an ideal speedy supper because they only take a few minutes to cook. Gnocchi is commonly served in a similar way to pasta, like Shaun Rankin's recipe of sweet potato gnocchi with tomato sauce, or it can be cooked in boiling salted water then pan-fried in 'foaming butter' such as Dominic Chapman's pan-fried halibut with wild mushrooms and gnocchi.